Ana Vera Events: I love any kind of blossoms so when approached with an opportunity to participate in almond orchard photography I just had to say yes! 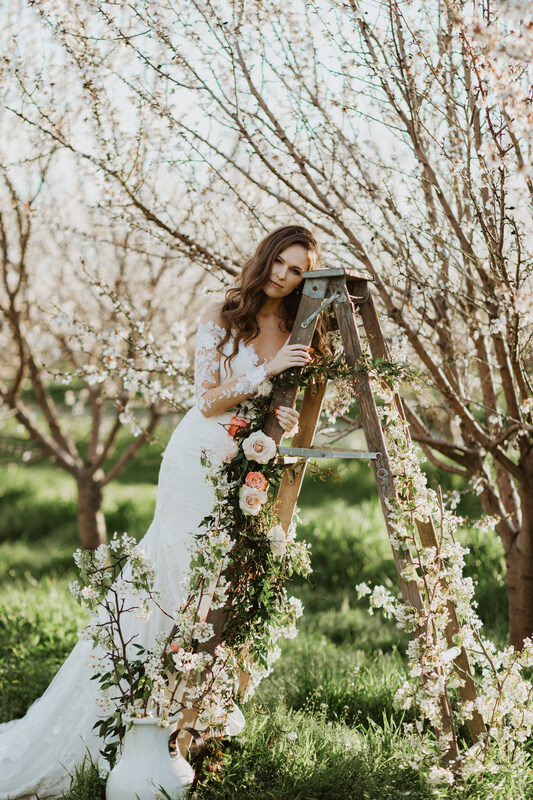 Typically for weddings cherry blossoms are utilized but almond blossoms are just as gorgeous! The white orchards with a slight touch of pink go on for miles and miles. It is just breathtaking! Never get tired of those gorgeous blooming trees. 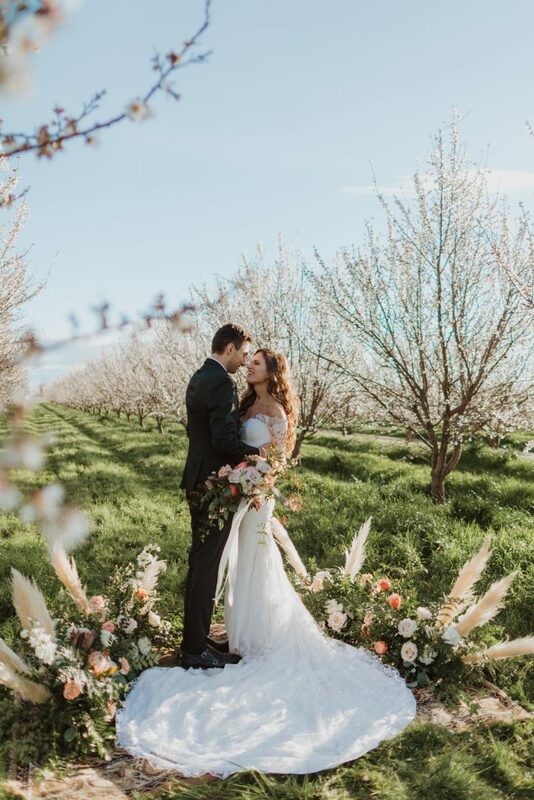 They are so beautiful on their own, however I wanted to see how you can style a wedding inspired by blossoms. When coming up with the concept for the shoot, the team and I definitely wanted to try something new and combine different styling elements. 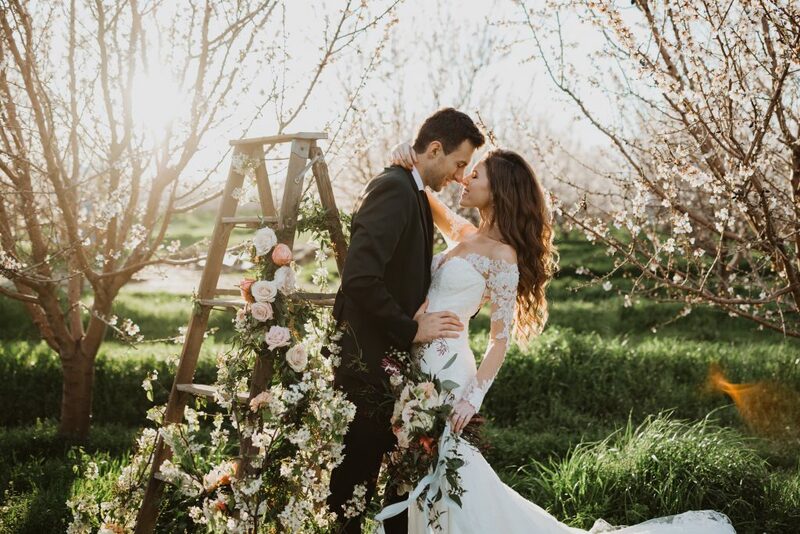 We decided go to for a bohemian elegant theme and one of the best ways we did that is with the florals! 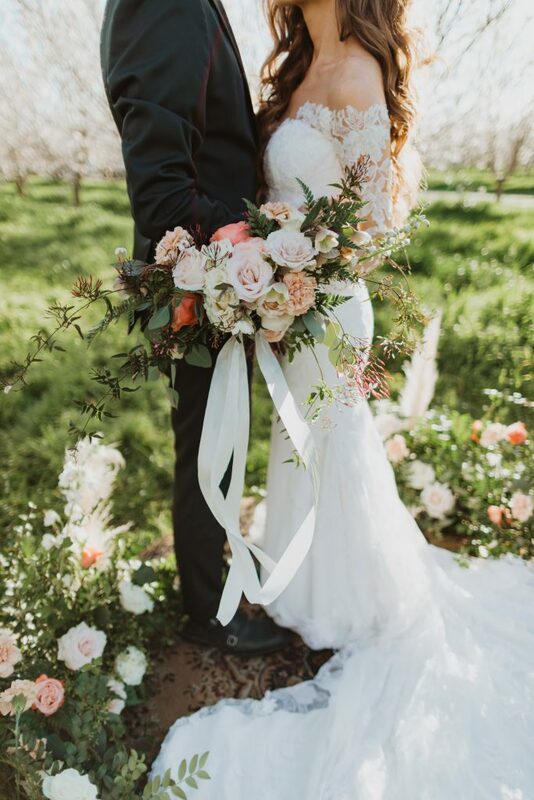 Jessica from J.Blooms did an absolutely stunning job with the flowers! 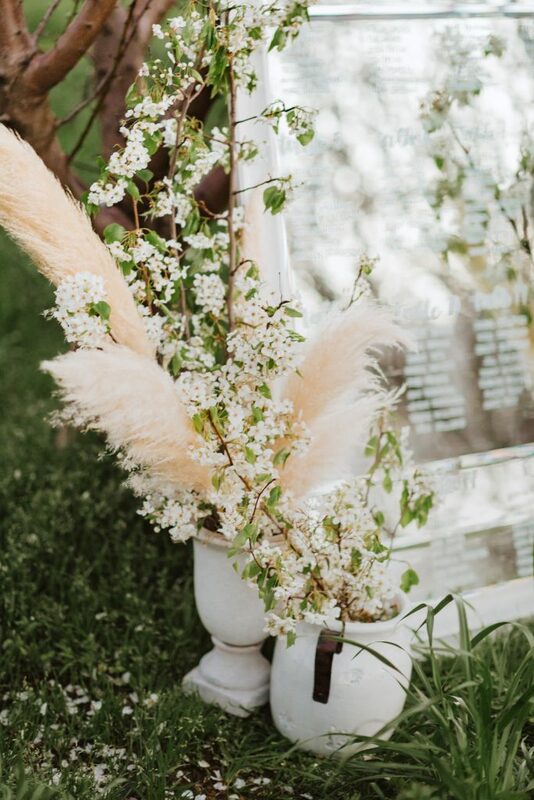 She went with a neutral and elegant color palette all white having luscious boho style arrangements with pampas of course! Nothing says boho more than pampas! 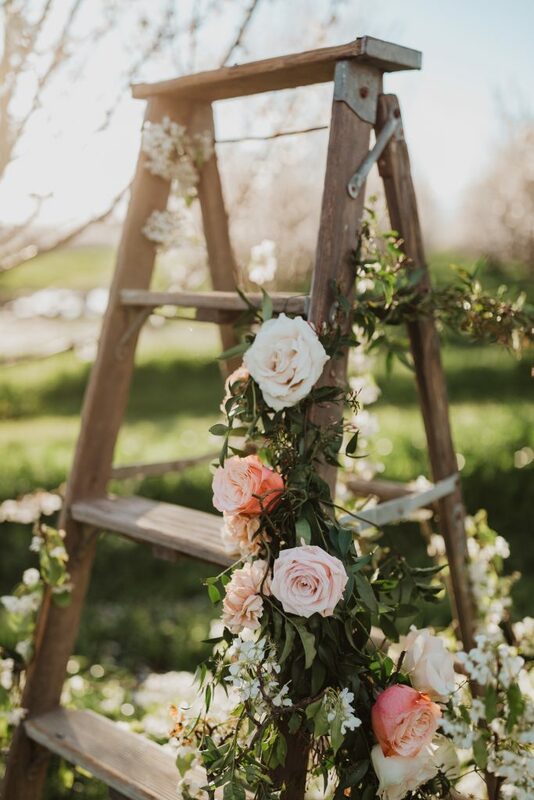 For the shoot we had a variety of arrangements; a neutral bridal bouquet, garland, table centerpiece and lots of ground arrangements for the ceremony location! 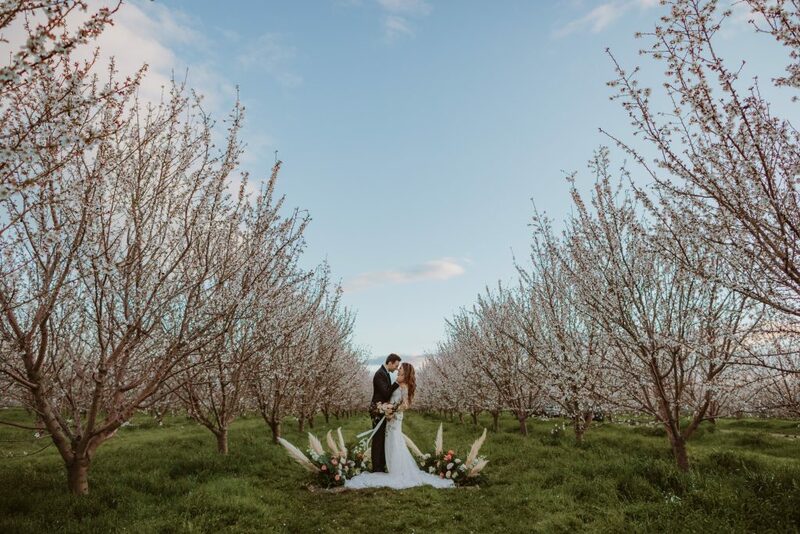 For the ceremony inspiration we decided to skip the arbor or arch and give the beautiful almond trees all the attention. We did however focus on the ground level by adding a neutral toned bohemian rug and surrounding it with Jessica’s luscious arrangements. 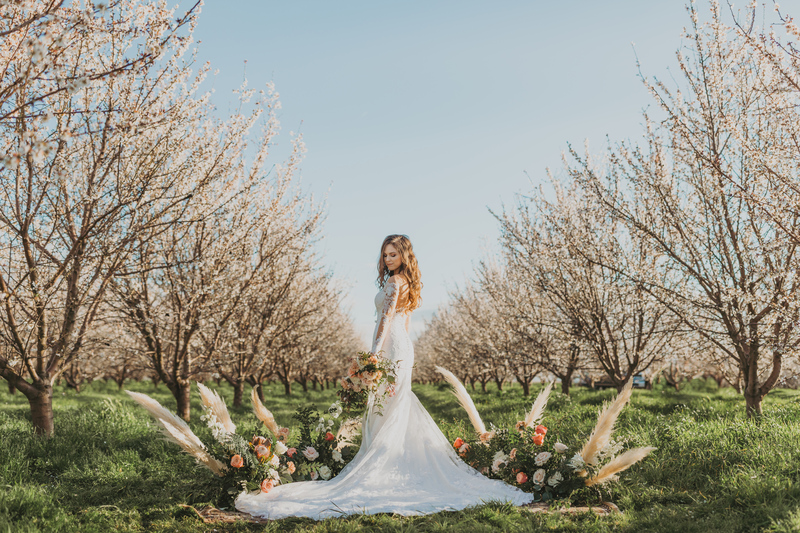 Can’t get over just how gorgeous do those pampas look against the whimsical background! Alright here’s a pro tip, every wedding should have a photo booth or backdrop. Guests love a good photo opportunity! Keeps them entertained and the bride and groom can take some shots there as well! 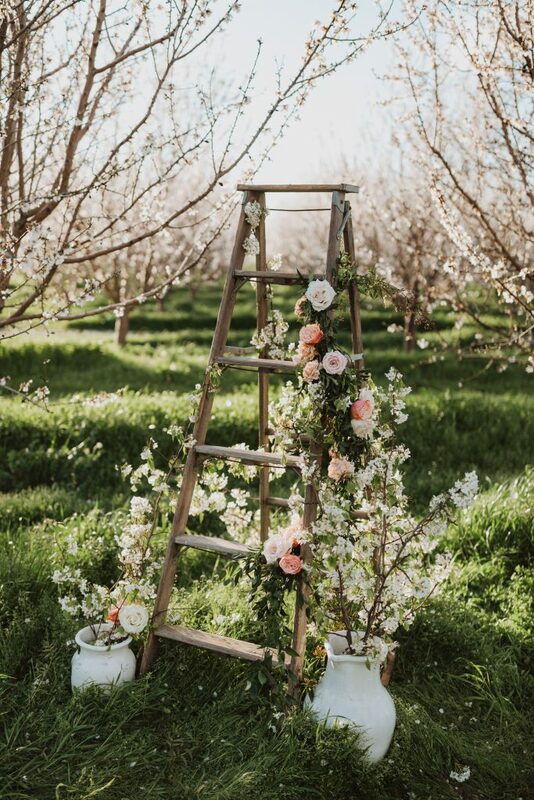 For this styled wedding shoot, we covered a simple wooden ladder in blossoms, greenery, flowers and just like that it was simple no more! It definitely made for a whimsical prop for photos. The best part is you can pose in a variety of ways with a ladder! 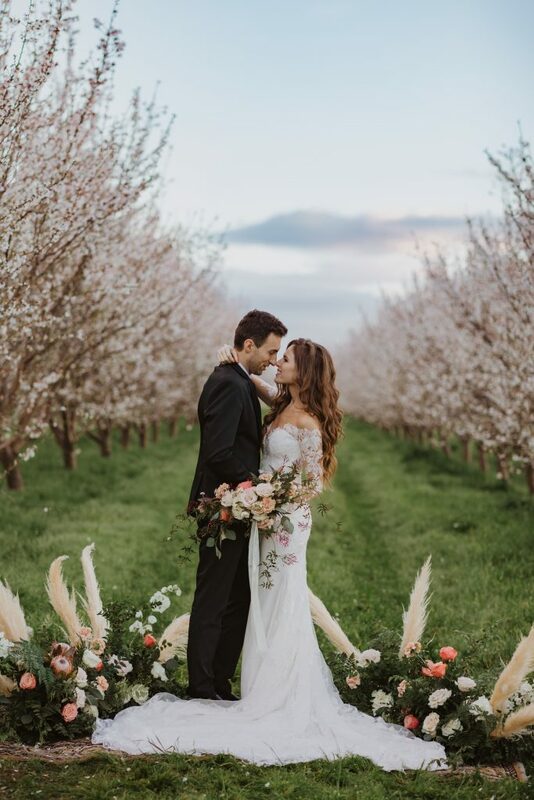 Loved combining the floral garland with the blossom branches. It made for a unique boho and elegant look. Time to cut the cake! The wedding cake for was made by Ellie from Ellies Macarons and it was almost too pretty to cut! 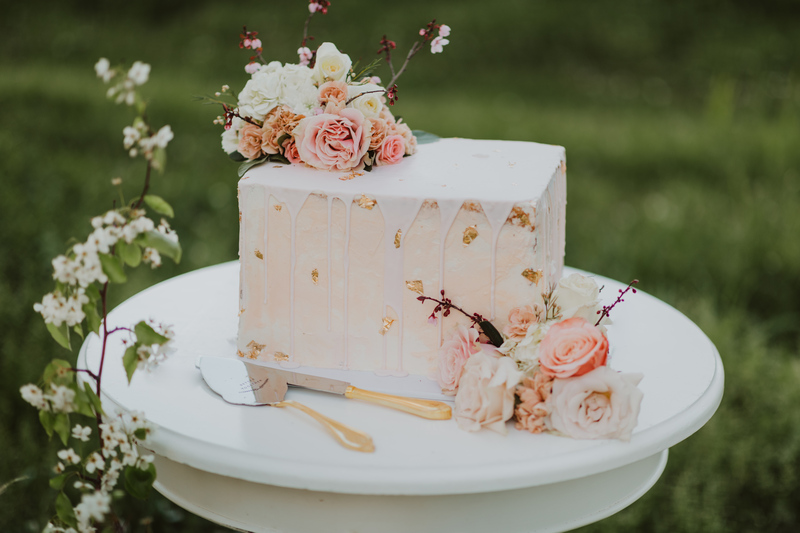 Loved the modern design, the abstract pink and neutral cream, the beautiful dripping icing and the gold flakes. Although it was gorgeous, we definitely cut it and indulged in yummy ducal de leche and chocolate flavors! The design of Ellie’s cake was very unique as you can see! I’ve seen round cakes, square cakes but this rectangular wedding cake was definitely a first! 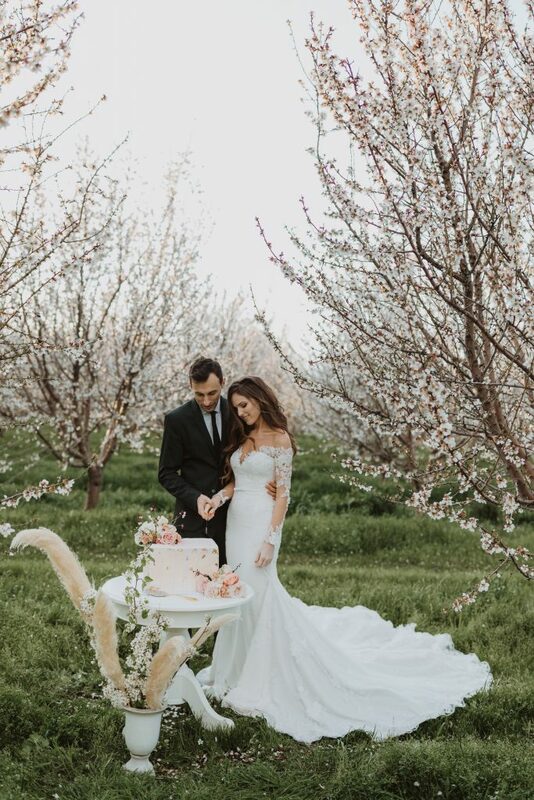 Ellie perfectly tied in the cake with the blossom theme by incorporating blossom branches as well other neutral toned flowers. 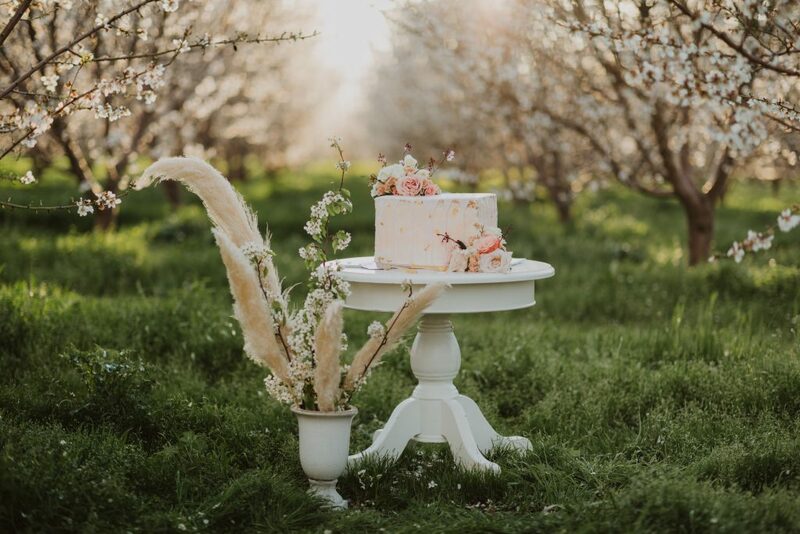 I placed the cake on an elegant white table which is the perfect size for wedding cakes. Love how the white furniture looked alongside the green grand and blossoming trees! 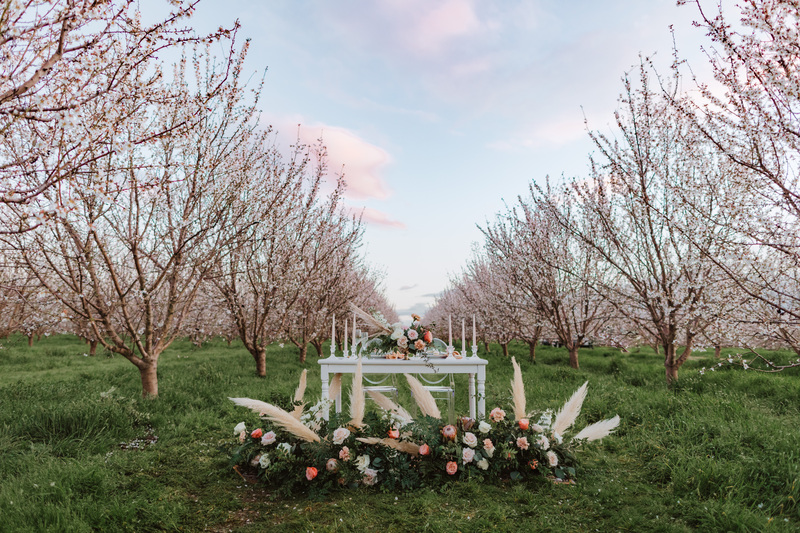 To tie in the pampas, Jessica and I created a blossom and pampas arrangement and anchored it below using a gorgeous floral ceramic vase from Happily Ever Details. Oh! And can’t forget about the cake server set from Memorable Event Rentals. It was the perfect gold touch that matched the gold flakes on the cake. 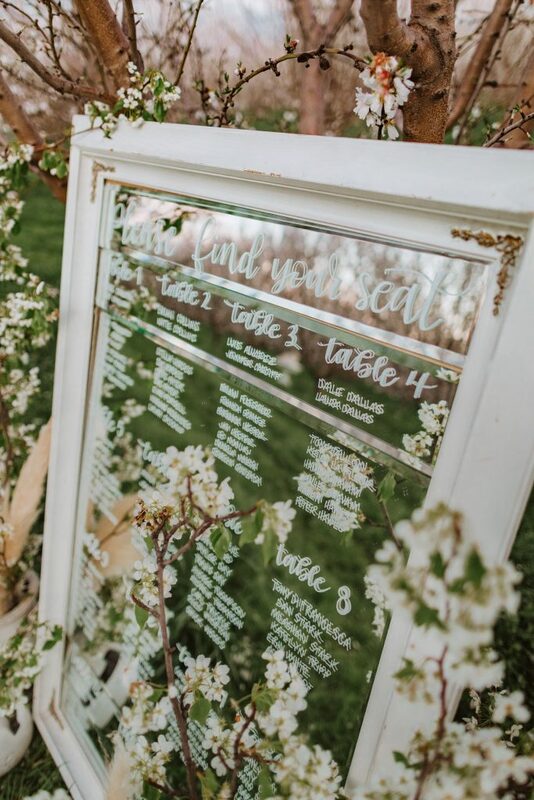 Who doesn’t love a good sweetheart table! 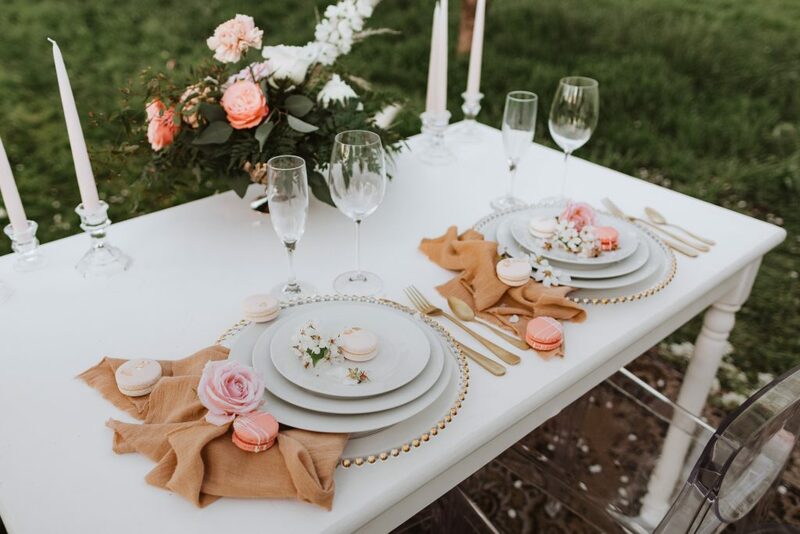 This table for two was the perfect combination of elegant, modern and boho. The bohemian elements consisted of the rug, gauze napkins and of course the lush floral arrangements. The table itself is simple, white and looked so beautiful among the white blossoms! Now the ghost chairs from Criate Rentals were definitely my favorite! 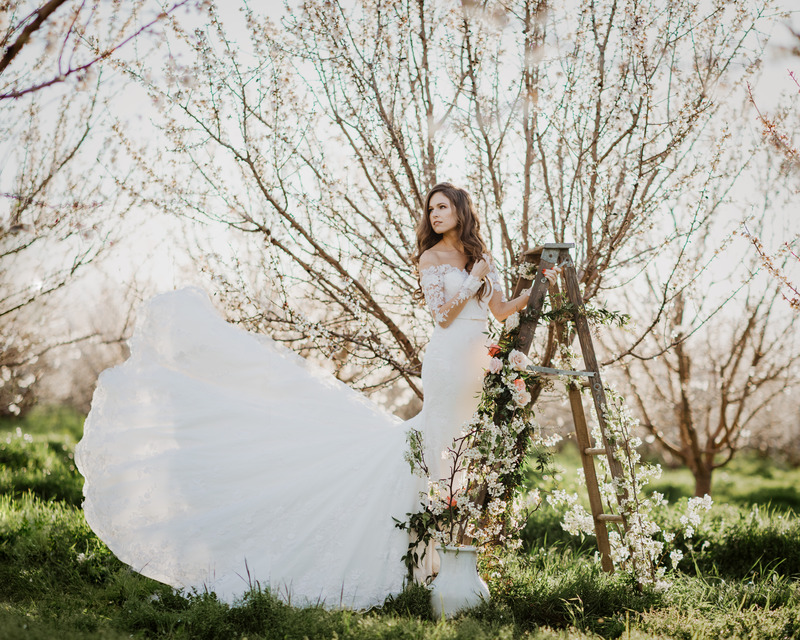 Their elegant but modern look added a chic and sophisticated touch to the whimsical shoot. 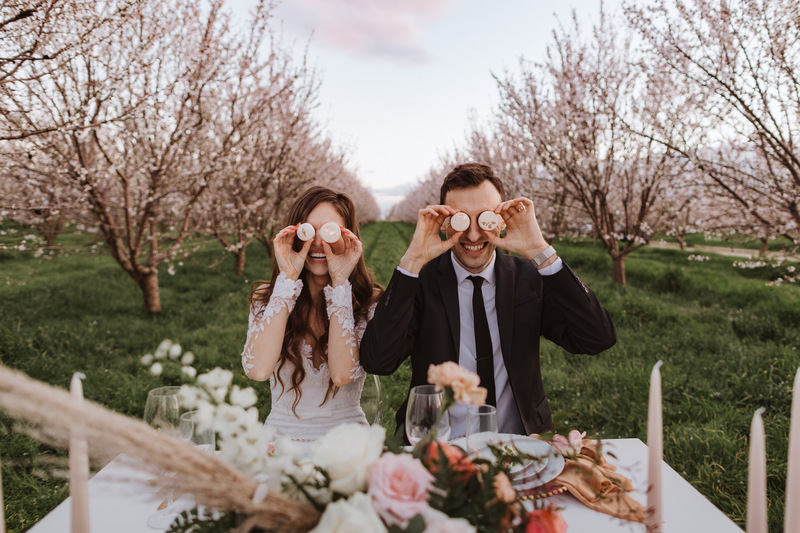 Bottom line is you can never go wrong with a ghost chair at your wedding! Now onto the table top decor which was also both modern simple and elegant. I decided to go with clear gold beaded chargers to tie in with the chairs and same goes for the clear candle holders. 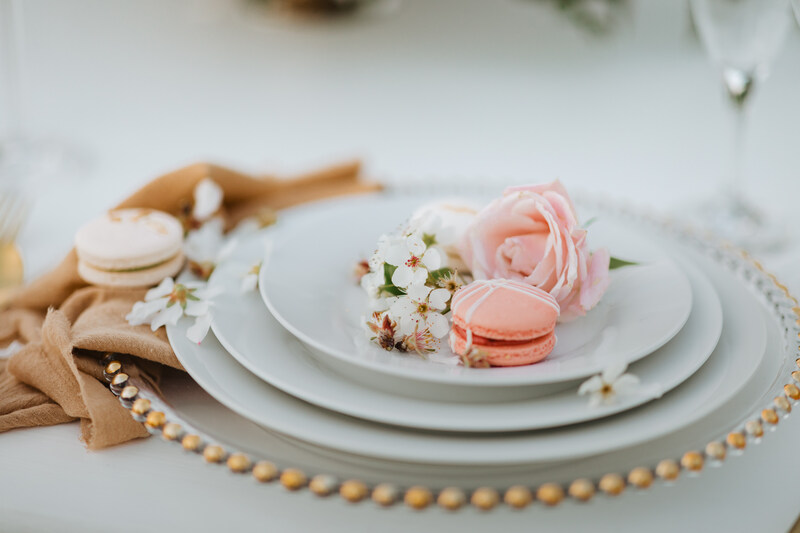 Along with the simple white plates and gold flatware the overall look was simple elegant and sophisticated. I loved paring the simple place-setting with the effortless and boho gauze napkins. 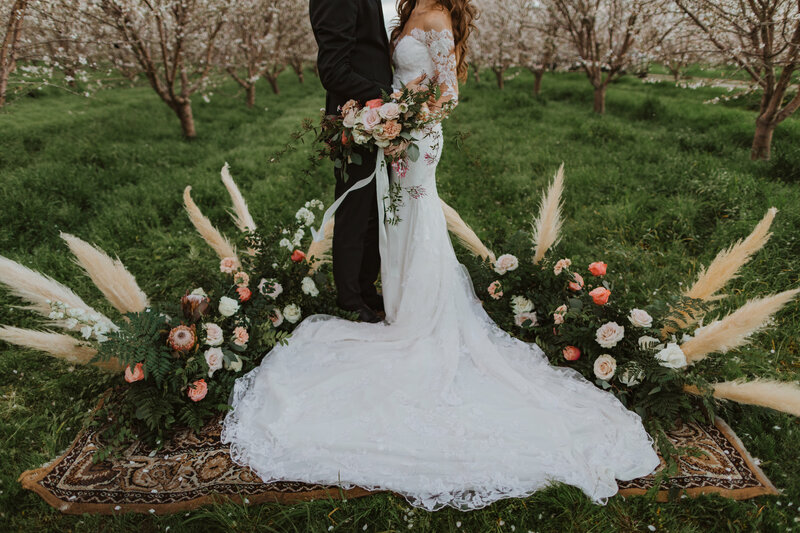 It definitely tied in the the elegant with the boho! Oh and how could I forget about the prettiest candles from Target! they were just the lightest, prettiest and dustiest shade of pink! Overall loved how this table for two turned out amongst the blossoming white orchard! 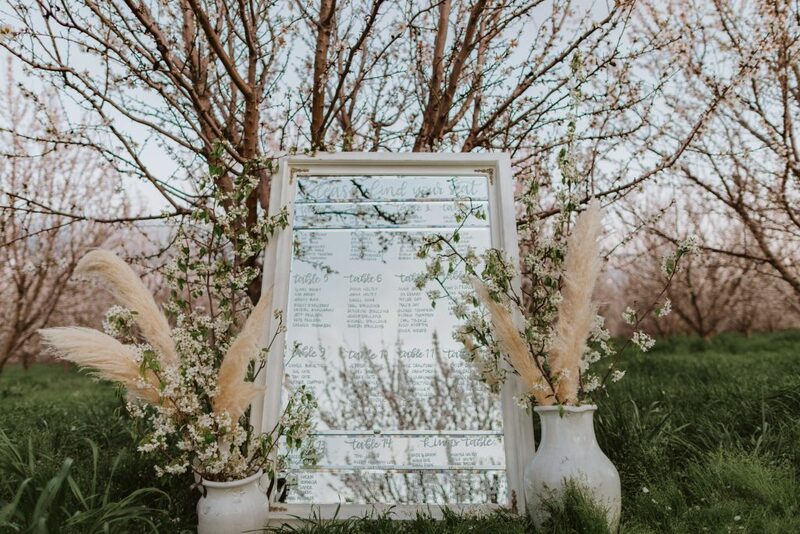 One of my favorite decorative items of a wedding has got to be mirror seating chart! I used my simple white framed mirror from my inventory and it looked so pretty against an almond blossom tree! The pampas and blossom branches definitely spruced up the mirror and gave it a wow factor! Just loved how the pampas and blossom branches look together. They look to modern and airy together! 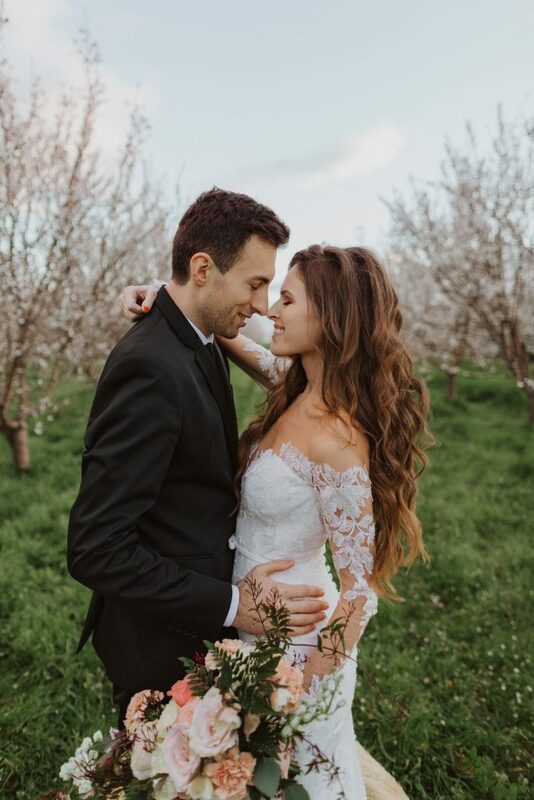 Diana Hurzhyi: I remember when I scheduled my first appointment to try on wedding dresses. I knew that this was probably the most important part of the wedding and it needed not only my attention but my maid of honors as well. I dragged all of my girls with me to help me make the decision. I honestly stepped in to my first appointment with ZERO expectations. I had no clue what kind of dress I wanted to say ‘I do’ in. The possibilities were endless and so we started trying on just about anything to see what can potentially be ‘the one’ for me. Sadly first appointment was slightly disappointing however I did not feel bad because I had two more lined up that week. When I walked into Bride To Be Couture I automatically felt so welcomed. My stylist walked me and my girls to our private area and started asking a bunch of questions to help narrow down my search. They off she went pulling dresses from the rack. One by one I started trying on the dresses and modeling for my girls in anticipation of their approval. Then finally I put on the dress that I’m wearing here and when I walked out I could tell this was the one. The girls were practically drooling with excitement. This was the dress that I looked my best in. After receiving the dress I took it to my seamstress to make final touches to the lace on the top part and take it in around my waist. 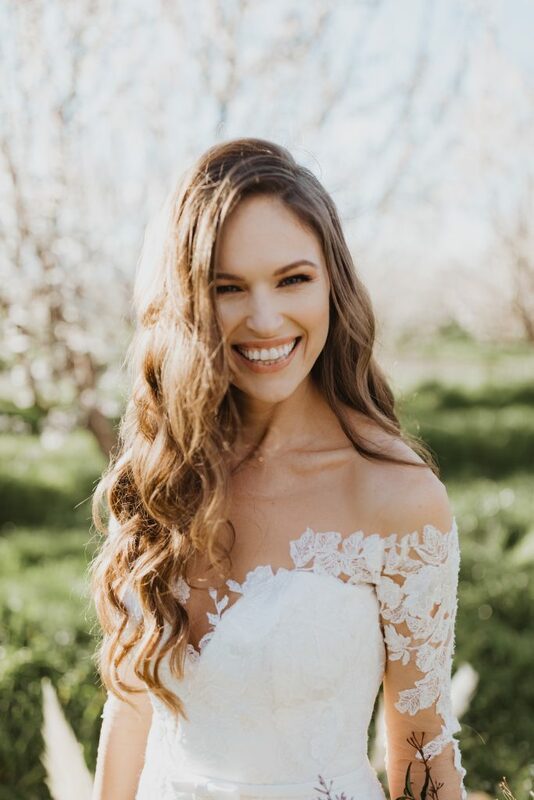 (if you have a seamstress outside of the bridal boutique I highly suggest going that route since they will most likely save you money instead of overcharge you). 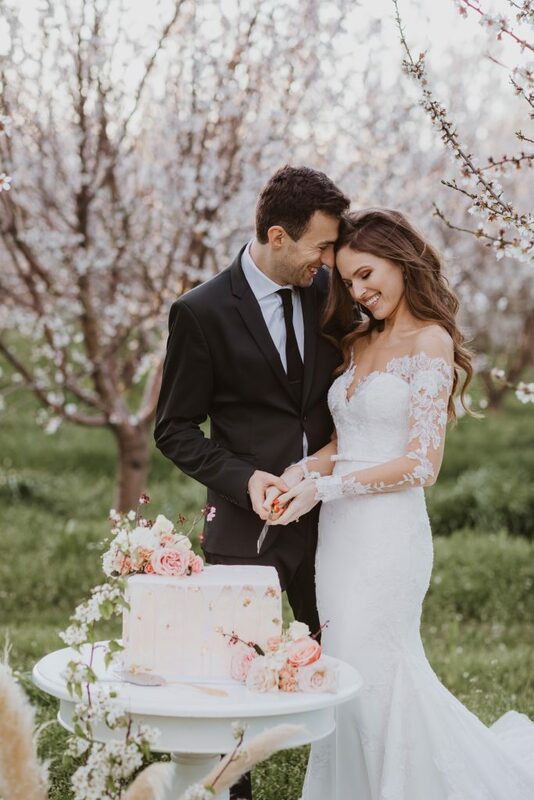 Once the touches were complete I came for my last fitting and the dress fit like a glove. There is nothing more heartwarming then to see the best part of the wedding come so nicely together. Andrei’s suite was a tough decision at first. I wanted him to look amazing and feel great in what he is wearing. Our first thought was to go to Macy’s and pick out a designer suite. To our disappointment they did not have anything that was classy and made my beloved look great. Our next choice was going to Zara. It was definitely a better choice. We picked out a suite for $250 and invested another $50 to get it altered to fit him perfectly. We were both so satisfied with the quality and how it looked. I wanted the suite fitted and not too baggy and fitted it was! He looked so good in that suite I still get chills just thinking about it. 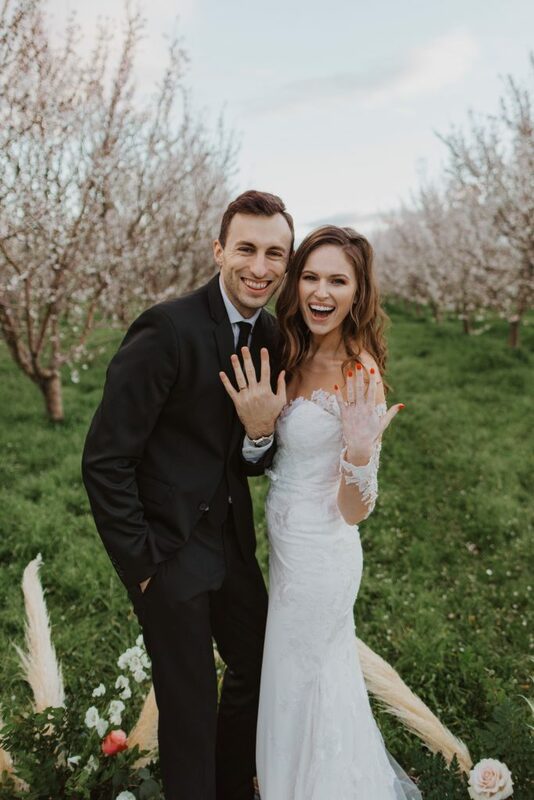 Diana Hurzhyi: The process of getting my ring started in December 2017. Andrei went in to the jewelers asking for a very specific ring. He already had an idea of what I wanted but the most important part was that it needed to be rose gold. The jewelers had to place a special order since they don’t carry rose gold in stores. As Andrei patiently waited he prayed to know when the right time would be. The right time came shortly after Valentines Day on February 17th. He popped the question and of course I said YES! I absolutely adore my ring and how it looks on my hand. It compliments my hands as opposed to overpower them. The wedding band we picked out together. 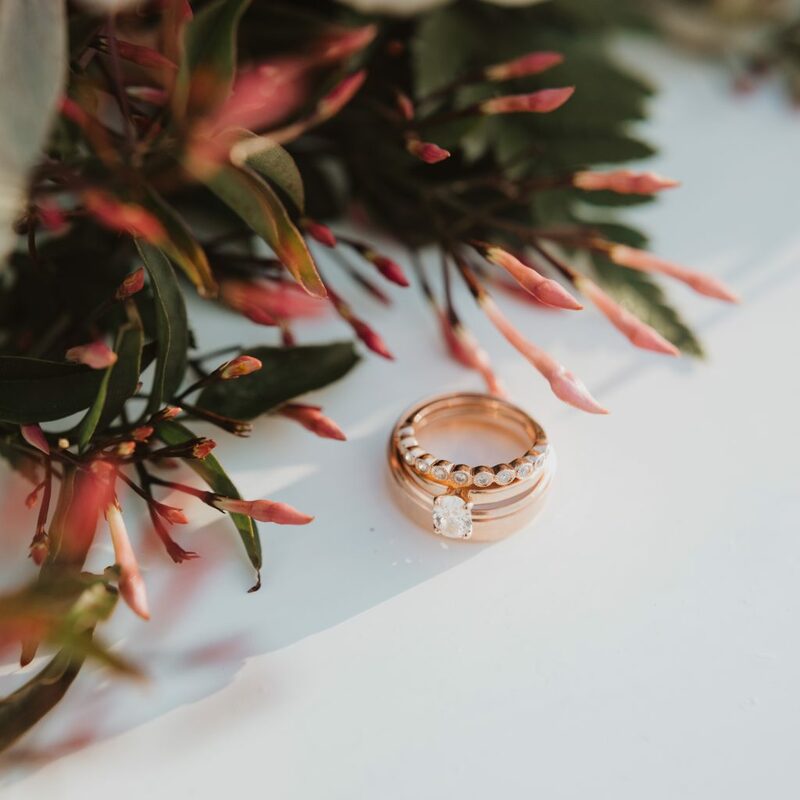 I wanted to something that would not take away the attention from the engagement ring so this simple wedding band with stones was a perfect match. And of course I had to buy him a rose gold ring as well so it matches mine! 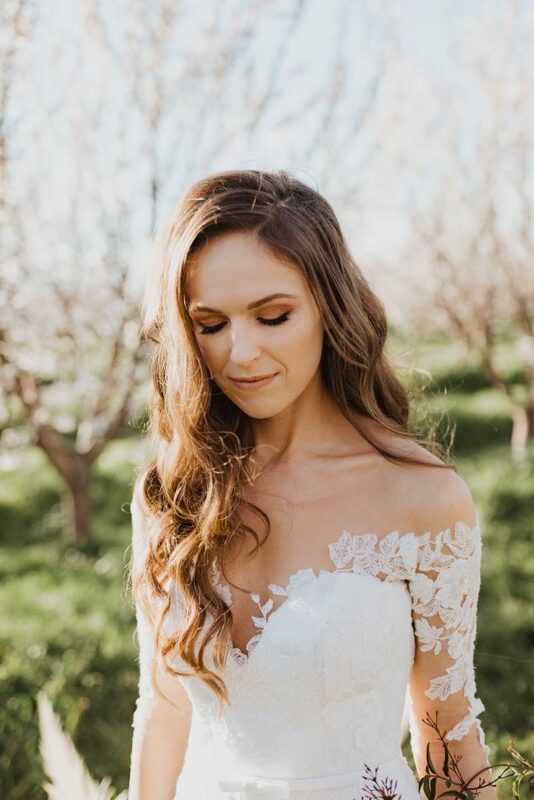 Diana Hurzhyi:When Megan reached out to me about doing this styled shoot I thought how cool would it be if my wedding hair and makeup artist did my hair and makeup for this collaboration. And a few texts later Ella agreed to make me pretty for this shoot. She used beautiful peachy colors to compliment the look in the blossom field. The tones were absolutely perfect for the atmosphere. And of course the hair was down in beautiful waves that added to the entire look. 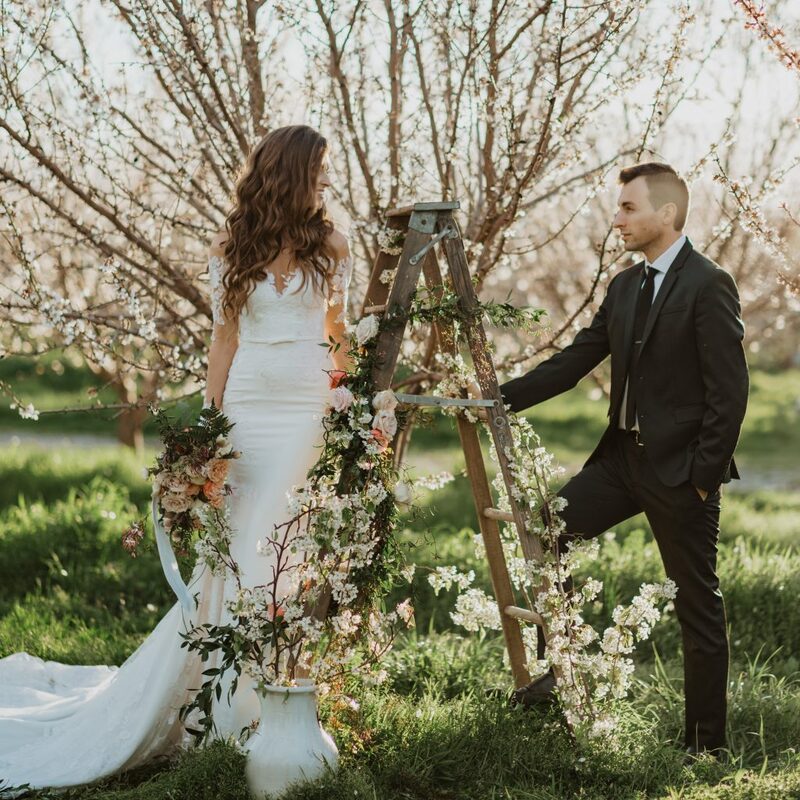 Overall look was very gentle complimenting the atmosphere in the almond orchard.